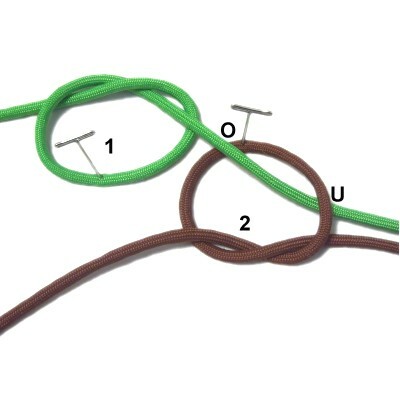 Description: The Linked Overhand Knots described on this page are sometimes called "connection knots". Their primary purpose is to link two cords together. They can be used as a base for other knots, to attach new cords to a design, or for decoration. Most of these designs are historical knots that date back to the early days of Macrame. You may find them under different names than what is shown here, since they can be used in fishing, sailing and climbing. 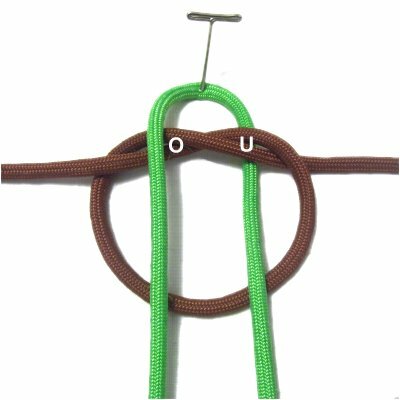 These unique knots are very strong and sturdy, and can be used to make nets, hammocks, and other items that hold weight. 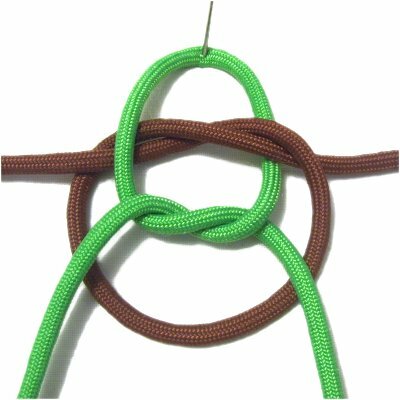 The Cross Pendant is an easy project where the Shamrock Knot is used to connect two cords prior to tying the other knots. Click on the link or image if you wish to view the pattern. When you shake hands, you make a connection, which is why the Shake Hands Bend is perfectly named. 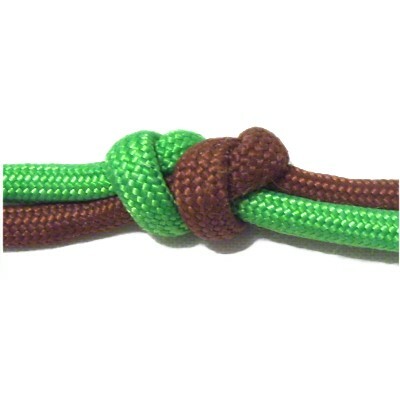 There are several variations of this knot. The instructions below are for the most basic form. 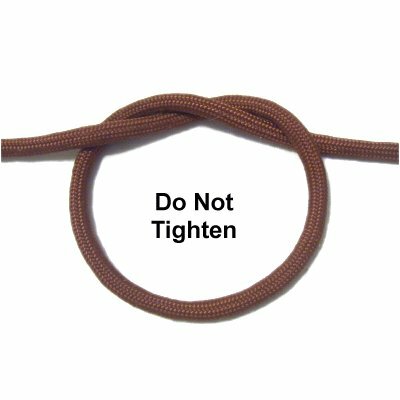 This knot is probably the easiest of all the Linked Overhand knots, and is the best technique for making nets. Step 1: You need two 18-inch cords to practice, preferably different colors. Secure both cords to your board, so they are vertical. 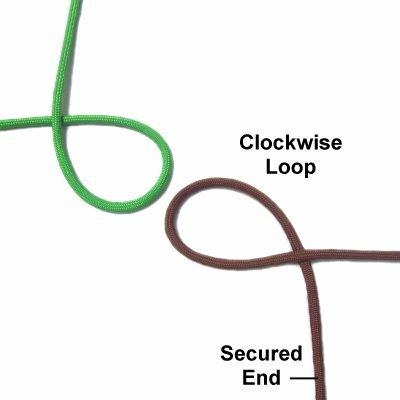 Use the left cord to make a counter-clockwise loop. Arrange the knot so the top half of the cord is vertical and the bottom half is horizontal. 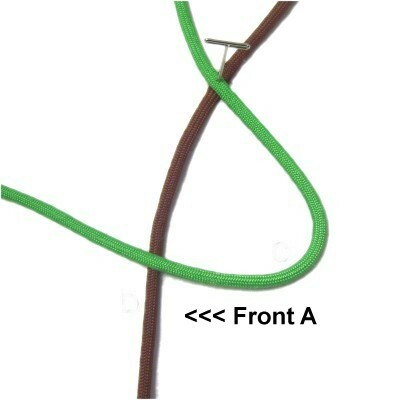 Step 2: Pass the lower half of the right cord through the first loop from below, which is under - over. Complete the clockwise loop by passing it under the top half of the cord. Step 3: Move the loops toward each other slightly so there is an extra space between them. Secure both loops at the crossing points, if you have not done so already. 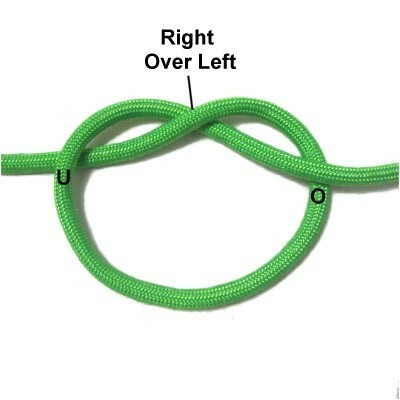 Step 4: Complete the right Overhand knot by moving the top half through the space from below. 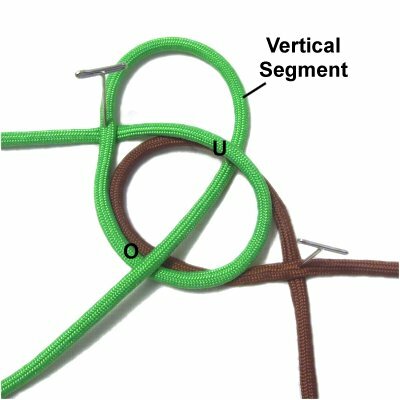 It should pass under two segments and over two, since the cord is passing through both loops. Step 5: Complete the left Overhand knot by moving the top half through the space from the top. It will pass over the lower half of the left cord, and over two segments of the right cord. At the bottom, it passes under one segment from each cord. Step 6: Tighten the Linked Overhand knots gradually, until all the slack is removed and the knot is firm. 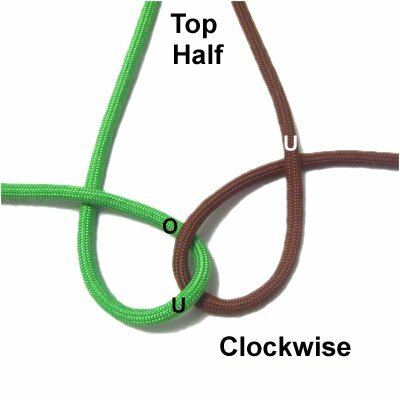 Linked Overhand knots sometimes have more than one name. 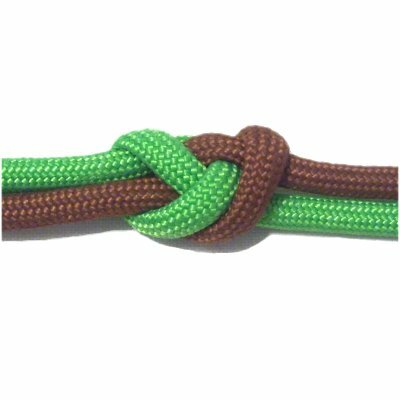 This one is called the Shamrock Knot, the True Love Knot, or the Lover's Knot. This technique is useful when tying Crown Knots, so after you connect the cords, there is a sturdy base to start with. Step 1: You need two cords to practice, at least 18 inches long. 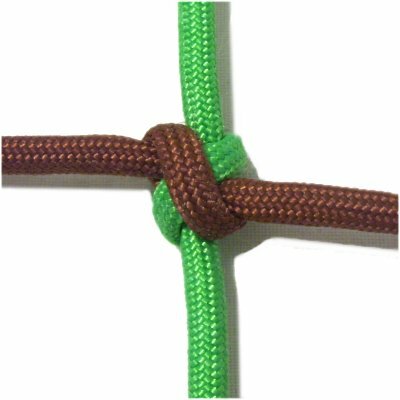 Make an Overhand knot at the center of one cord. Arrange it on your board with the crook (curved area) closest to you (forward). Step 2: Fold the second cord in half and secure it near the crossing point of the knot. Pass the left half over the crossed area, and the right half under it, arranged vertically. Step 3: Complete the Overhand knot with the second cord. 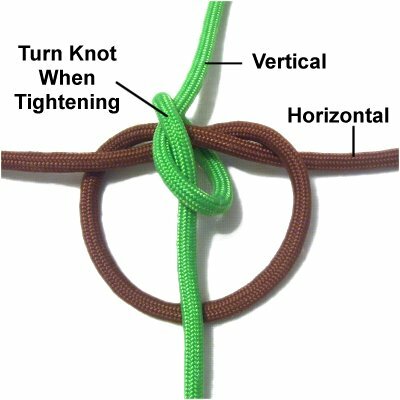 Make sure the crossed area is inside the first knot. Step 4: Tighten the second knot, turning it sideways (upright) so the ends of the cord are vertical. Then tighten the other knot, keeping it flat so the ends of the cord are horizontal. Turn the knot over so you can see the crossed portion, which is the front of the knot. The ends of the cords head in 4 different directions. 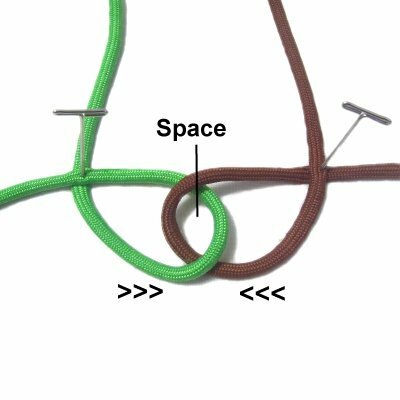 This applies to the Shamrock knot as well as the Rosendahl's Bend, which you will learn next. 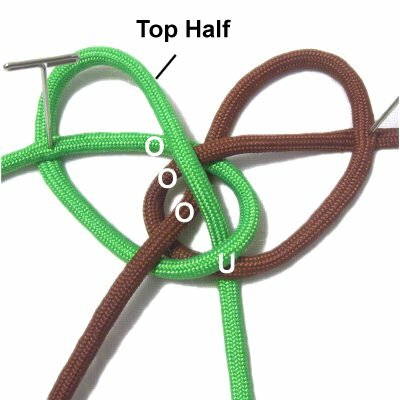 The Rosendahl's Bend, also called the Zeppelin Bend, is a unique way of tying linked Overhand Knots. 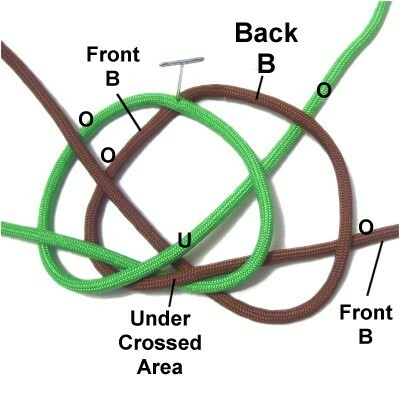 Like the Shamrock knot, the ends will head in four directions. 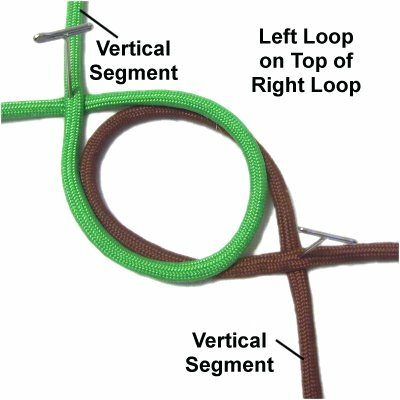 For this design, you need to pay close attention to how the loops are arranged when you first begin. Step 1: You need two cords to practice, at least 18 inches in length. Secure one cord on your left. 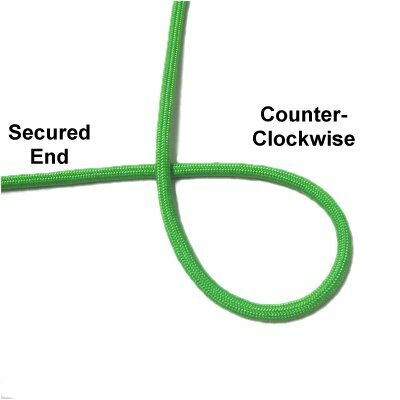 Make a counter-clockwise loop in the center of the cord, arranging this end vertically when you are through. Step 2: Secure one end of another cord close to the front of your board. 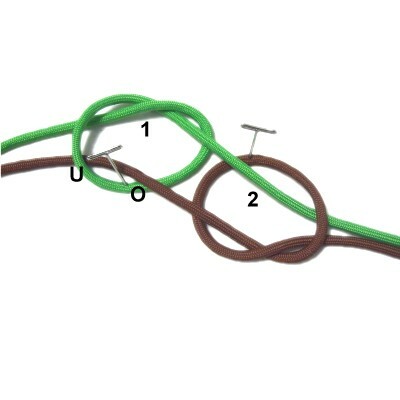 Make a clockwise loop in the center of the cord, and arrange this end horizontally to the right. Step 3: Carefully move the left loop on top of the right loop. Secure both loops at the crossing points. Make sure you can clearly identify the vertical segments of both loops. 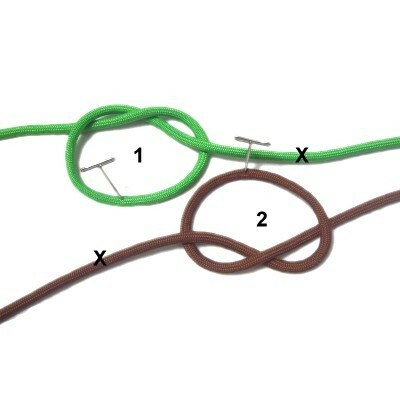 Step 4: Complete the Overhand Knot with the left cord by moving the vertical segment clockwise. Pass it through both loops under - over (from below). 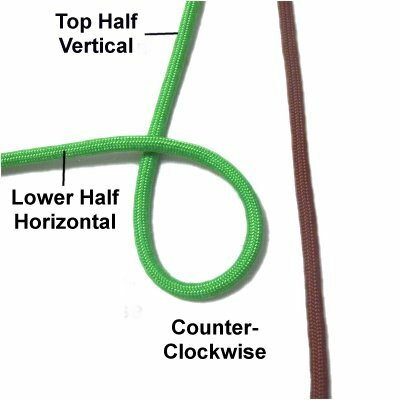 Step 5: Complete the OH knot with the right cord by moving the vertical segment counter-clockwise. Pass it through both loops over - under (from the top). The arrows in the image above indicate the direction of the ends as you tighten each knot. Tighten the entire knot firmly after reducing the size of the linked Overhand knots. Some of the Linked Overhand Knots are used in fishing. This one is used to repair broken lines. It's easy to make in hand (without a board). 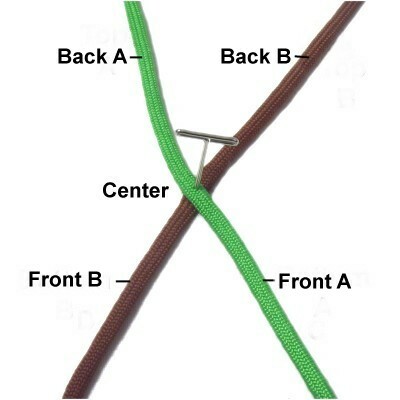 The Fisherman's knot can be used to add more length if your cords become too short and you need to add more material. It's easily disguised, since it's smaller than the other knots on this page. Step 1: To practice, you need two cords, each at least 18 inches long. 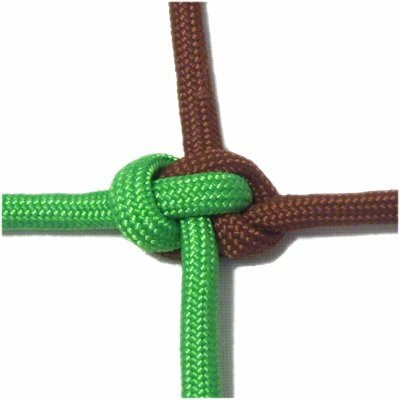 Make an Overhand knot in the center of one cord, so the right half passes over the left to make the crossing point. 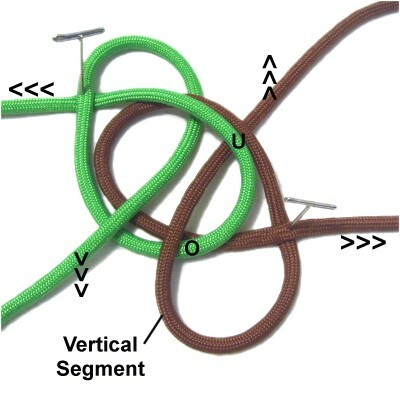 The ends should exit the knot as shown, under on the left, and over on the right. Do not tighten it yet. Step 2: Use the second cord to make an Overhand knot just like the first one. 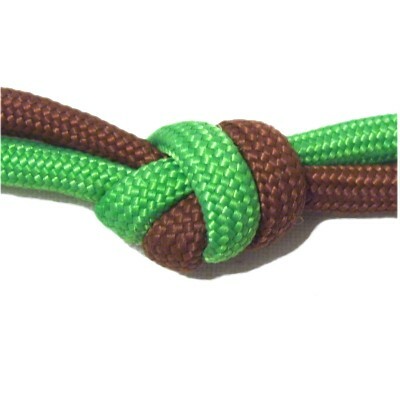 Position it to the right of the other knot, inverted as shown. 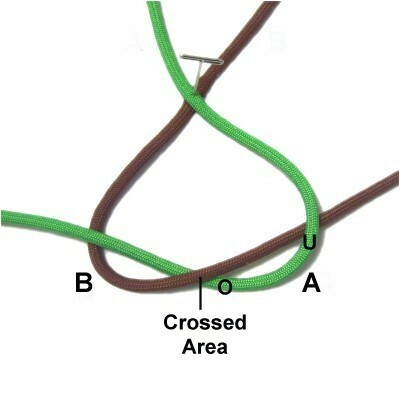 The two segments marked with an X are the left halves of the cord. Step 3: Move the left half of the first Overhand knot through the second knot, passing over - under the curved area (crook). 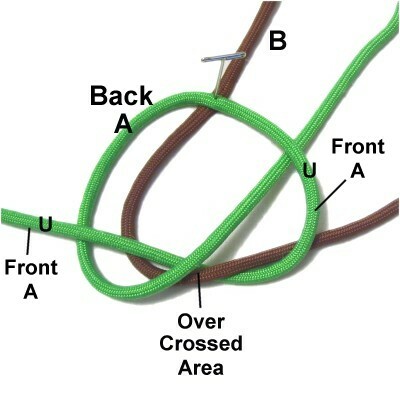 Step 4: Move the left half of the second knot through the first one, passing over - under the curved area. Step 5: Tighten the linked Overhand knots gradually. Make sure you don't twist or turn them. Linked Overhand knots like this one can get confusing. You will be moving both halves of each cord, so make sure you mentally label them as described in the instructions below. This knot is very thick and strong. It's very similar on both sides, which is an advantage. It will stand out more visually than the others, which is why it's a good choice for decorating two cords. Arrange the cords in an X shape, secured at the center. Mentally label the cords A and B, front and back half. Step 2: Move the front half of cord A to the left, so it rests on top of the front half of cord B. Step 3: Move the front half of cord B to the right, passing over - under the two parts where it curves. Mentally label the crossed area indicated. Step 4: Move the back half of cord A forward to the left, passing under the front half on the left. Move it counter-clockwise, passing it over the crossed area of both cords. Bring it under the front half of cord A on the right. Step 5: Move the back half of cord B forward to the right, passing over cord A, and over the front half of cord B on the right. Moving clockwise, pass it under the crossed area, and under the back half of cord A. On the left, pass it over both cords. Tighten the linked Overhand knots slowly, keeping the center of the cords secured until the knots are very small. 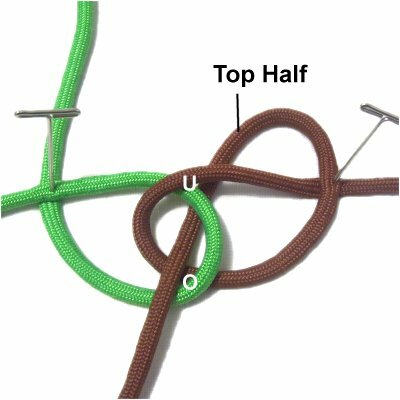 Have any comments about the Linked Overhand Knots? Contact Me.